Norouz is only a few days away! 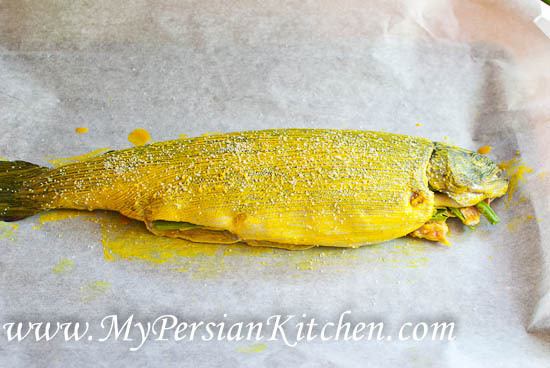 Today’s post is part childhood memories, part recipe, and part sharing Norouz related recipes by a group of Persian food bloggers! Well let’s begin. Do you ever find yourself thinking about one specific memory when you eat a certain type of food? 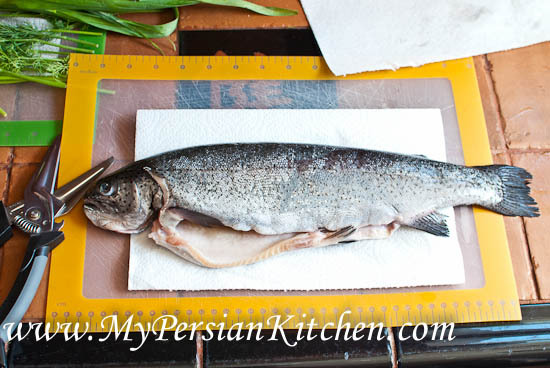 Well for me Trout, known as Ghezel Ala in Persian, is one of them. Various foods evoke different types of memories in different stages of my life. I have many food related memories. The truth is that the majority of my memories of Iran are always intertwined with some type of food related event. Every time I eat trout, I think of my paternal uncle, Amoo Hushang. My childhood memories of him are of a tall handsome man who was nice, but also serious. My uncle spent many years in the military prior to the revolution. Perhaps, it was his military background that made him seem more rigid to my young eyes than he actually was. Nowadays, we sometimes communicate through Facebook. His emails are very eloquent; he writes very properly and uses fancy words. I have to pay extra attention so that I understand what he has written! When I read his emails, I realize how simplistic my communication in Persian is. I have these snippets of memories of traveling to a town, the name of which I can’t remember for the life of me, where Amoo Hushang had finally finished building a villa, much to his sweet wife Mimi joon’s delight, that took a very loooong time to complete. The highlight of this trip was the fact that we were going to have trout from the local lake, for which the area was apparently known for. I have absolutely no memories of what the trout looked like or how it was cooked; all I know is that I like trout because of that specific trip! Now onto today’s recipe! For this recipe I used Narenj, also known as Bitter Orange, Sour Orange, or Seville Orange. 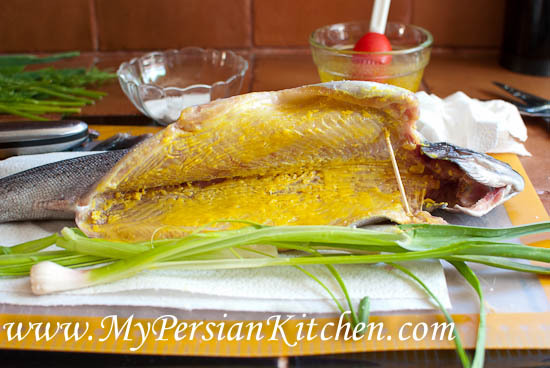 Narenj is very popular in Persian cuisine as it is often paired with fish or even squeezed in a cup of piping hot Persian Tea. Taste wise it is a combination of bitter and sour. I find that it really complements fish well; once it is squeezed on fish it adds a nice flavor to it, and the bitterness doesn’t come out at all. For this recipe I have kept things simple: fresh green garlic, parsley, dill, lemon, butter, turmeric, and of course salt and pepper. Wash and pat dry fish. Cut fins with scissors or a sharp knife. Season the cavity with salt, then rub with one of the fresh garlic bulbs cut in half vertically. Lucky fish, mine got a nice garlicky exfoliation! Melt butter, then add turmeric. Mix well. Brush the inside of the fish with the butter all over. Cut half of a lemon into slices. Then cut each slice in half. 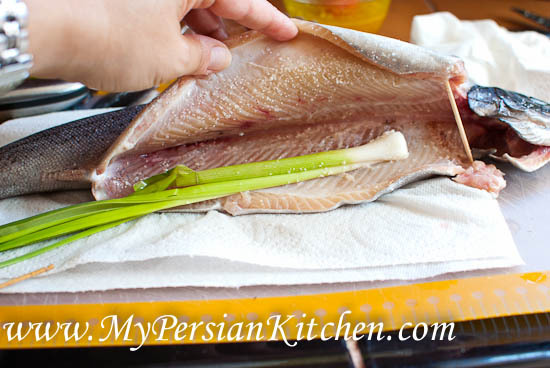 Place three of the slices inside the cavity, then divide the herbs and pack the inside of each fish with the herbs. Season fish with salt and pepper, then brush with butter. Place on a cookie sheet lined with parchment paper butter side down. Season the top with salt and pepper, then brush with butter. Bake for 30 minutes. The outside skin will be crisp and the inside moist and delicious! Place fish in a platter and arrange sliced oranges around the fish. 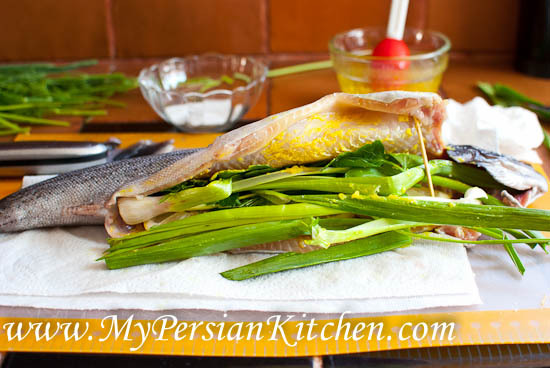 Serve this delicious fish with Sabzi Polow! Clean fish and pat dry. Cut fins with scissors or a sharp knife. Remove roots of fresh garlic and wash thoroughly. Cut the bulb in half vertically. Wash and pat dry parsley and dill. Add salt salt to the cavity of fish. Then with one of the cut fresh garlic bulbs rub all over the cavity of each fish. Season with a dash of pepper. Melt butter, then immediately add turmeric. Mix well. Brush butter all over the inside of each fish. Cut half of a lemon into slices. Then cut each slice in half. 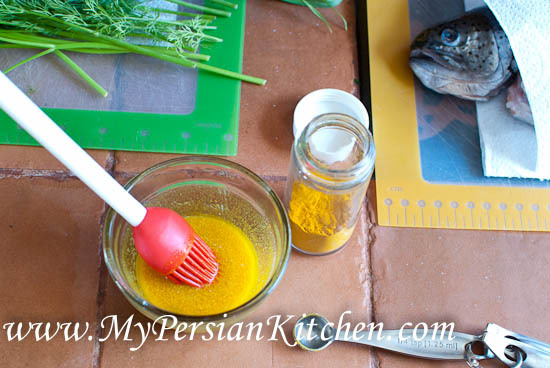 Place 3 half slices of lemon in the cavity, then divide the fresh herbs and fresh garlic bulbs between the two fishes. Pack the inside with the herbs. Season the top of the fish with salt and pepper, then brush with butter. Place the fish on a cookie sheet lined with parchment paper butter side down. Season the top portion with salt and pepper then brush with butter all over. Now onto the last part of today’s post! 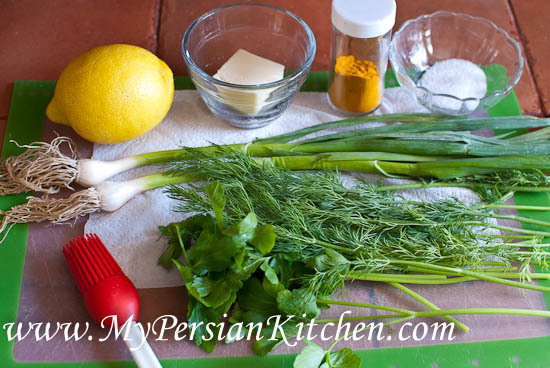 Please check out all the delicious recipes that other Persian food bloggers have created to share for our Norouz 2015 Collaborative Posts! Very touching, nostalgic memory of your uncle. 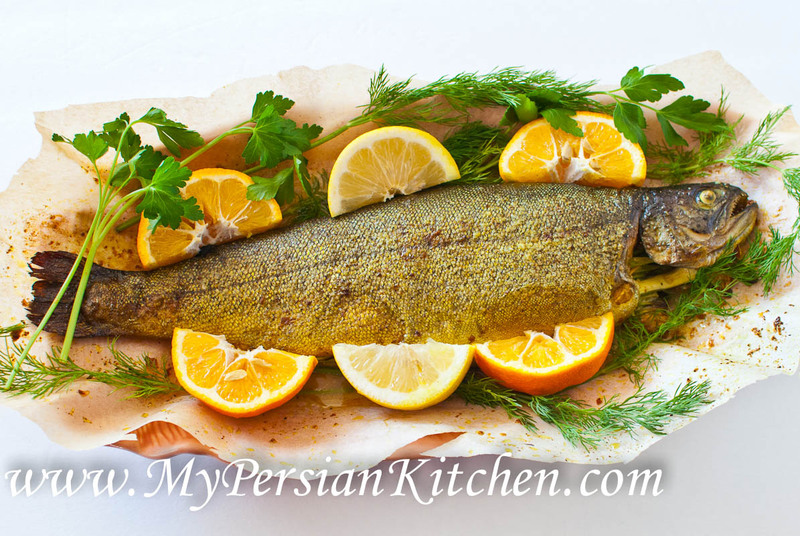 Beautifully prepared trout, stuffed with narenj and herbs for flavoring/seasoning, I can see how a fabulous combination they make. Happy Nowruz to you and yours! my goodness this looks good. fresh fish with citrus is such a bright, light, satisfying meal. do you have a source for narenj? can you get it at middle eastern markets? This looks so delicious!! I got hungry reading this and looking at this pictures, and it’s long past dinner time I hope to try this sometime – thanks for the inspiration! First of all, LOVE the new website design. The colors and design of the website are perfect. 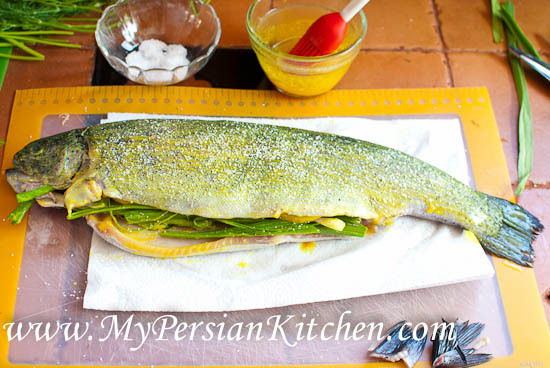 This is a great recipe, I’ve never cooked a whole fish, but this seems like a perfect place to start! What a beautiful story and recipe. Trout with orange sound delightful! Eid-eh shomah mobarak!